My cousin Gillian decided to run this as her first 10k. I signed up to join her and cheer her on, though I initially signed up for the 5k. I did this because the Tom King Half was the weekend before and I wanted a bit of a break. But then, of course, the half got cancelled, so I went ahead and upgraded to the 10k, since the cost was the same. I wasn’t really planning on racing this, although it would be cool to PR, of course. I knew I was capable of PRing anyway, since I had beat my current 10k PR in the 15k I ran a month earlier. Gillian was aiming to go under an hour. I don’t have any pics that I took since I didn’t carry my phone with me because (a) it was raining and (b) I didn’t have any pockets. And I somehow didn’t end up in any of the official photos. So all I have is this photo of my outfit post-race. Sorry I’m not in it. I did not have a good morning. I had laid out my outfit the night before, but I still was rushing to get ready, despite the race being at a comfy 11am. I left and then realized halfway there that I didn’t have my Garmin. I also realized that my stomach wasn’t happy. I turned around, retrieved my watch and some Pepto Bismol and then headed to the race. Once I got to the start line area, I found Gillian in line for packet pickup. It was long, so thankfully she was already halfway there when I found her. We got our numbers, pinned everything on, then dropped off our t-shirts at her car. It was time for the race to start and we hadn’t hit up the port-a-potties yet, so we ran to find them. I think they realized that their packet pickup line was still crazy long because the race didn’t start until 11:10. The first mile is basically all uphill. It took about half a mile of sticking with Gillian for me to figure out that I was not going to PR and that this race was going to be miserable. I steered off to the side to take a walk break. I ran a little, then took another walk break. I just couldn’t catch my breath on the hills. Finally, after we hit up a water station close to the end of the first mile, the uphills stopped and I was able to maintain a pace for awhile. This mile felt decent, except for the horrible side stitches I was experiencing. I just tried to keep breathing. I only walked briefly through the water stop. Another okay mile. The 10k was two loops of the 5k course. I forgot that I hate this. This one added insult to injury by actually having us run through the finish line and then turn around and repeat the course. Demoralizing. Only a brief water station stop on this one as well. I saw Gillian go by before the turn around and called out, “Looking good!” Actually, she looked like she wanted to die. I wasn’t about to yell that. She was probably three minutes ahead of me at that point. A repeat of the first mile except with longer walk breaks because the hills wore me out even more. My slowest of the race. I was pretty exhausted by this point. I just told myself to keep going until the water station. My walk through the water station at the end of mile 5 didn’t do much, so I took another one shortly thereafter. Then I took off, ready to finish. On the home stretch, with about a tenth of a mile to go, I heard someone pick up the pace behind me, so I picked up my pace too (about 7:30-7:40, it seems). And then a car drove out in front of me. I had to slow down to avoid dying, and then I lost concentration and the girl passed me one second before the finish line. Ugh! So, my watch said this was 5.98 miles. I have no idea if the course was actually short, but it doesn’t appear to be USATF certified so it wouldn’t surprise me. I’ll start with the things I liked. It started at 11am. They had tasty post-race food (hot chicken and a beignet from Party Fowl). The course went down roads I hadn’t ever ran on. There was free beer, if you drink beer (I don’t). The volunteers were great. I dropped my St. Patrick’s day sunglasses in the first mile and they were waiting for me at the finish line. And now for the things I didn’t particularly like. They didn’t have a lot of people working packet pickup. I don’t know if there was a shortage of volunteers or if it was just how it was organized, but there was only one person per race (5k and 10k) digging through a box of bibs looking for your number. It was inefficient. For a not very cheap race, it was disappointing to get a t-shirt instead of a tech shirt. I don’t like 10k races that are two loops of 5ks (may be a personal preference) but running through the finish line and then having to turn around was not cool. The course was short (probably). Besides the hot chicken and beignets, there was no other food, and you only got one tiny piece of each of those. No bananas. I don’t know what vegetarians were expected to eat. Also, the post-race party had alcohol but not water. So we were handed a piece of hot chicken and then nothing to wash it down with (if you don’t drink beer). I don’t mean to sound like I’m complaining about everything (and truthfully, my bad performance is kind of playing into how I felt about the race as a whole), I just expect more when I pay $40 for a race. 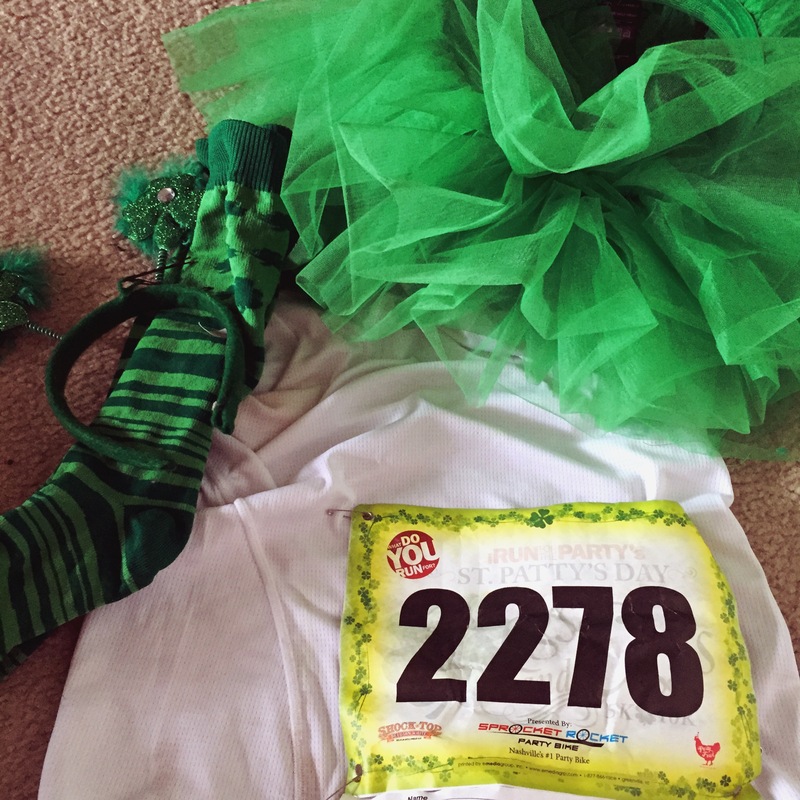 This entry was posted in Race and tagged 10k, kegs and eggs 10k. Bookmark the permalink. ← I’m in a slump.